Manchester City’s accounts for 2010-11, which were published last week and showed a world record annual loss for a football club of £194.9m, also revealed that City had net transfer spend of £53.6m over the summer. That was net outlay on Sergio Aguero, Gael Clichy, Samir Nasri, Denis Suarez and Stefan Savic even accounting for the receipts from the sales and / or permanent departures of Jerome Boateng, Shay Given, Joao de Silva, Craig Bellamy, Felipe Caicedo and Shaun Wright-Philips. That £53.6m will be amortised (spread out, in accounting terms) over the next five years. The accounts also show that the club’s total wage bill grew by £40m, year on year, from £133m in 2009-10 to £173.97m in 2010-11, with the majority of that growth being on players’ salaries. Even allowing for 76 new non-playing employees in the year (who will have cost £5m in total if each new marketing person, scout and coach is earning £65,000-a-year on average), that means that player costs have risen by around £35m year on year. This is extraordinary because it suggests the contracts of the seven new players for 2010-11 (Boateng, Y Toure, Silva, Kolarov, Balotelli, Milner and Dzeko) plus a couple of contract renewals cost around £35m more combined than the amount saved on the combined wages of Robinho, Benjani, Petrov, Bojinov, Sylvinho, Garrido and Ireland. Or about £60m-plus. City’s wage bill is the biggest single reason that the club are in danger of failing to meet Uefa’s Financial Fair Play break-even requirement. Under FFP, clubs will have to break even in the long-term, although limited losses will be allowed in the early years of the scheme. The first ‘monitoring period’ will be up to summer 2013, when accounts for the 2011-12 and 2012-13 season will be considered, and losses of €45m (£38.8m at today’s exchange rates) will be allowed. 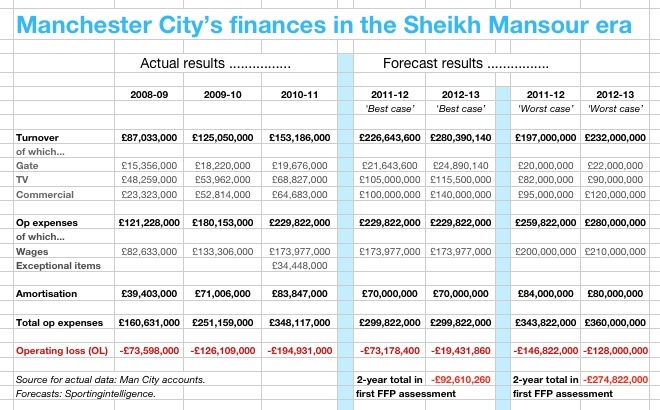 According to a Sportingintelligence analysis of City’s recent income and a forecast of City’s income and expenses for the next two years, it is inevitable City will fail to meet the first FFP break-even target in 2013. The question is by how much, and whether City can use loopholes to escape punishments likely to involve fines at least, and theoretical bans from Europe at worst. As the table below shows, the ‘best case’ scenario for City sees a combined loss over the next two seasons of £92.6m, broken down into £73m for the current season plus £19m for the season afterwards. This would be about £54m over the FFP limit, but that wouldn’t actually be a problem because certain historic wages can be discounted in the early years of FFP. (See this piece from February for more details). City could discount around £50m, plus probably another £10m per year for youth investment – and would therefore not fall foul of FFP at the first hurdle. There is a but, though. And it’s a huge but. Our ‘best case’ scenario involves City performing brilliantly in both major competitions for both seasons (top-two finish in the Premier League, plus late stages of the Champions League and ideally winning it), while massively increasing commercial income and simultaneously not increasing wages, or other costs. In other words, a highly improbable scenario. At the other extreme, if City don’t grow as rapidly as they’d hope and on-pitch success isn’t as significant as the late stages of the Champions League, and commercial deals don’t continue to grow massively, and costs don’t stay stable but actually rise, there are problems ahead. In that event, City could lose several hundred million pounds over the next two years combined (worse case £274.8m) and have no chance whatsoever of meeting FFP. Uefa will then be left with a headache of trying to enforce the rules and punish City, or amend the rules and look like they were never serious about a crack-down. As with all such scenarios, a ‘middle option’ is probable, with income rising strongly but costs also rising. It is hard to see how City will meet the first FFP target, or even be within a few tens of millions of pounds of meeting it, certainly without player sales. Any further player purchases will further endanger City’s chances of fulfilling the FFP criteria.